Cloud computing. For some, the term is wildly nebulous. Not long ago, even Oracle’s Larry Ellison publicly asked what the heck people meant by "the cloud." For others, cloud computing instantly raises concerns about security and reliability. After all, Gmail, a popular cloud-based e-mail service that has endured some high-profile outages, didn’t earn the nickname "Gfail" for nothing. • “We saved over $4000 in up-front costs by moving to an entirely cloud-based solution [for e-mail, Web hosting, virus protection, and more]. We were also able to substantially reduce our power bill and the costs needed to maintain and upgrade hardware.” --Bob Everett, president, Bottom-Line Consulting, a three-person firm offering various small-business services. • “As a non-IT person, I find cloud-based applications easier to set up and use than many [computer] applications, and I don't need to rely on internal IT support as much for assistance.” --Cristina Martin Greysman, executive vice president, business development, Vuzit, a six-employee software company. • “A power surge nearly destroyed our in-house e-mail server. Had we not recovered it, a great deal of historical knowledge and valuable information would have been lost forever, not to mention the lost productivity for days or weeks. Now we have a secure, redundant, cloud e-mail system we can access anywhere, anytime, with a consistent interface, and it’s made our business stronger.” --Kevin Hart, partner and founder, Hart-Boillot, a ten-employee marketing and communications agency. To be sure, cloud computing has its shortcomings (more on that later); but small businesses looking to cut computing costs and improve efficiency during this long recession are finding the many benefits of Internet-based software and services increasingly attractive. 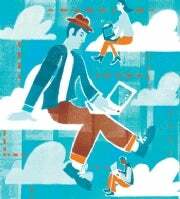 In fact, companies with 100 or fewer employees are expected to spend $2.4 billion on cloud computing services in 2010, up from $1.7 billion in 2009, according to Ray Boggs, vice president of SMB research for IDC. Here’s what you need to know about cloud computing: what it is, pros and cons, suggested services, and tips for applying it to your business. For decades, engineers have drawn a cloud to depict a network (such as the Internet) whose inner workings were unknown to them. From there, cloud computing evolved as a term to describe free or subscription-based services delivered in real time over the Internet. Cloud computing can refer to software as a service, such as Salesforce.com for customer relationship management (CRM); to file storage, synchronization, backup, and other utility computing, such as Dropbox; and to infrastructure as a service, including Amazon’s Elastic Compute Cloud, which delivers customizable computing capacity over the Internet. • Google Apps ($50 per user per year) and Google Docs (free) are offerings from the Google cloud empire. Google Apps is a business-class version of Google Docs and includes souped-up Gmail, Google Calendar, and Google Docs (for word processing, spreadsheet, presentations and forms) components along with administration capabilities. • Box.net (free for 1GB of storage; $10 for an individual plan; $15 monthly for three or more users) is an online workspace service for file sharing and collaboration. Paul Rosenfeld, cofounder and CEO of Fanminder, a mobile marketing firm with 12 employees, calls it "incredibly easy to use and powerful": “Having a virtual team makes it nearly impossible to coordinate workflow without their tools,” Rosenfeld says. • QuickBooks Online ($10 to $35 per month), unlike QuickBooks installed on PCs, makes collaboration easy across a small team. “It enables our bookkeeper, accountant, and outsourced CFO to all look at the same up-to-date information to advise us on our financial situation,” says Nicolas Boillot of Hart-Boillot, whose company uses the service. • Skype is popular for its free video chats as well as for the low-cost calls to landline and cell phones that it makes possible. Brand Thunder, a browser customization firm with 11 members, uses Skype for all-team meetings, says Patrick Murphy, the company's founder and CEO. Though Skype call quality varies, the service “allows easy and open communication between team members, despite their being geographically dispersed,” he says. • Highrise for CRM and Basecamp for project management ($24 to $149 per month each, depending on the level of service you choose) both come from 37signals. A number of small businesses we contacted recommended these services for their feature sets and ease of use. Cloud-based services can help small businesses dramatically reduce their software and other computing costs. Storing files on a secure, reliable, cloud-based service helps eliminate backup worries and gives you anytime access to your files. Usually, cloud-based services are simple to use—the only things you need are a computer (or in some cases, a mobile handset), a browser, and an Internet connection. And such services require no maintenance from the user. Easier collaboration with colleagues in distant locations is another oft-cited cloud benefit. “If you're the kind of small business that has employees who work from different places--or has remote employees, board members, or vendors who need access to your data--cloud computing is the only way to go,” says Rosenfeld of Fanminder. These benefits enable small businesses to “stay focused, be more collaborative, and bring products to market more quickly, because they’ve got access to the kind of infrastructure that only large companies used to have,” says Judith Hurwitz, president and CEO of Hurwitz & Associates and a coauthor of Cloud Computing for Dummies .